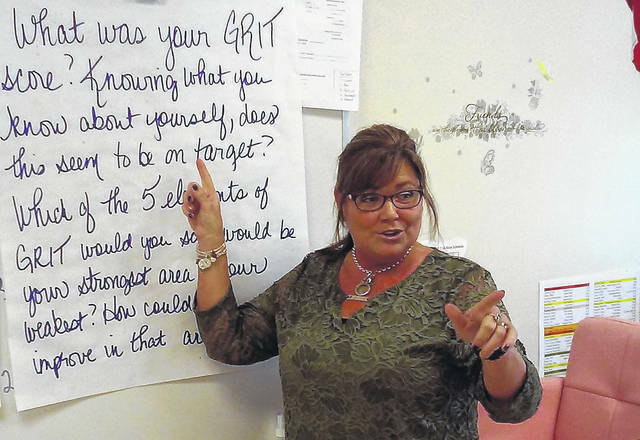 Editor’s Note — This is the fifth in a five-part series showcasing each of the five Highland County public school districts from a teacher’s perspective as they kick off another school year. Cindy Asmus and Cassie Adkins are separated by eight grades and a big hill at the Hillsboro City School’s complex at the south edge of town. But one thing that unites them in purpose is a love for their profession, and a genuine care and concern for the young people entrusted to them during the school day. Asmus is entering her 23rd year as an educator, and teaches senior English and advanced placement literature at the high school. The 1985 HHS graduate said it was the feeling of family that made her want to come back after college. At the elementary school, Adkins teaches fourth grade reading and social studies and is starting her 24th year in teaching. Like Asmus, she is Hillsboro born and raised, graduated from HHS in 1991, and always wanted to be a teacher. A common thread with both women is the sense of belonging and family at Hillsboro City Schools. “It makes the learning process so much easier, and I want my students to be happy at school and build those relationships,” Adkins said. While at Wilmington College before she began student teaching, Asmus said she was observed by a veteran educator whom she deeply respected. Later that day, during a meeting, her mentor summed up what she saw. Their goals for their students in the coming school year are slightly different due to the grade level they teach. For Adkins, it’s getting her fourth graders to learn what she calls “cooperative learning,” in other words, learning to play and work together, and instilling in them a love for reading. One of the objectives for both teachers is the safety and well-being of their students, and it’s a big concern for Asmus. She said the problem is the violence isn’t confined to the big cities. For Adkins, the concern strikes closer to home — at home. Adkins began seeing a disturbing trend in the late 1990s, and it has become worse today. Today’s opioid crisis is a big concern as well. Though some of the problems facing their students can be traced to what’s going on at home, both teachers agree the solution starts at home. Hillsboro City Schools’ recent open house gave Asmus reason for hope. This entry was tagged highland county, Hillsboro, hillsboro high school. Bookmark the permalink.